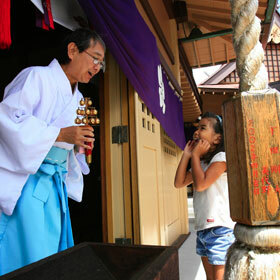 WEEKEND SCENE » Tessa Uchimura, 4, couldn't contain her enthusiasm yesterday morning before a blessing by priest Shinken Naitoh during the annual Back-to-School Education Blessing at the Shinto shrine Hawaii Kotohira Jinsha-Hawaii Dazaifu Tenmangu in Kalihi. Hundreds celebrate the power of individual acts. Candidates vying for Ed Case's seat say there must be checks on powers. Art and cultural lessons come with Hawaiian weapon-making. The Honolulu golfer ties for 26th in the major, 13 shots behind winner Sherri Steinhauer. Manu Ululani mixes up and applies the frostings that make your cake special. Charges to consumers won't increase for another year.